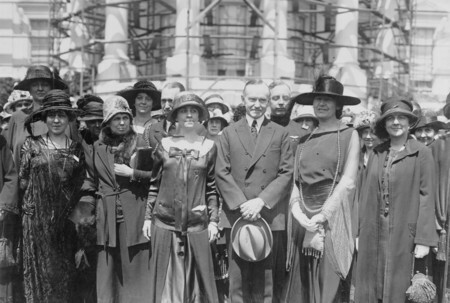 Photo of President Coolidge standing with members of the American Association of University Women on the White House lawn. AAUW’s history is well documented on its website. The founding members, a handful of college-educated women, met in 1881 in Boston, Massachusetts. 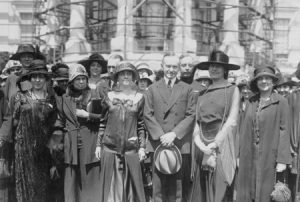 Their purpose was to provide opportunities—through donations, scholarships, and fellowships—for more women to pursue higher education. In 1919, AAUW members contributed $156,413 to Marie Curie for the purchase of one gram of radium, leading eventually to her discovery of radiation as a treatment of cancer. Believing in this mission of advancing equity for women and girls, a group of women met on October 4, 1973, to establish the Edmonds Branch of AAUW. During that first year, 1973-1974, fifty members joined. Early branch programs focused on equity in education, the changing world of women, and social and global concerns. By 1986-1987, the branch had a local scholarships program in place. Although the number and amount have varied through the years, scholarships have been a continuous annual commitment. Over the years a variety of projects have been undertaken to increase the knowledge and awareness of members. The projects have included: Candidate and Issue Forums (with the League of Women Voters), Expanding Your Horizons (a full-day workshop for girls, emphasizing STEM careers), Lobby Day in Olympia, and partnerships with Edmonds and Shoreline Community Colleges. 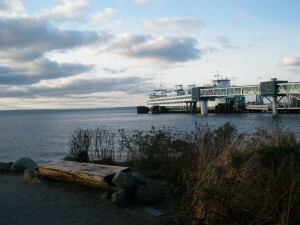 In 2013, the branch name was changed to Edmonds SnoKing to reflect the fact that members live in all areas of south Snohomish and north King Counties. On November 9, 2013, we celebrated the 40th anniversary of the branch. Now, and in the future, we continue to advance equity for women and girls through advocacy, education, philanthropy, and research.